Badly behaving quarks could be pointing to a new elementary particle, and the Large Hadron Collider might be able to hunt it down by the end of this year. When a proton and antiproton are smashed together at nearly light-speed inside the Tevatron Particle Collider in Illinois the Top Quarks, the heaviest of six types of quarks and one of the smallest particles in existance, aren't quite behaving they way the Standard Model of particle physics says they should be. This is a rather big deal. Now the Large Hadron Collider, the largest particle accelerator in the world, could be mere months away from discovering the new elementary particle that's been screwing with the quarks. Teams at the Tevatron first started noticing the quarks flying off in the wrong directions back in 2008, but these tests could have been flukes, or perhaps a problem with the equipment. Scientists are nothing if not cautious, so nearly four years and hundreds of collisions later, scientists are almost ready to say something is definitely wrong. Where the Standard Model says nine percent of top quarks should be flying off in the direction of the proton beam, the actual number is closer to 45 percent. Well, we do. 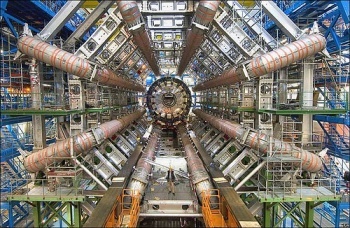 Some scientists, like Johns Hopkins University's Markus Schulze, believe that the particle could be discovered with the Large Hadron Collider by the end of 2011. Finding this mystery particle, says Schulze, "would be a beautiful and delicate signal of physics beyond the standard model." "Particle physicists know that the standard model is incomplete," says Moira Gresham of the University of Michigan. "We've been waiting a long time to get some more concrete hints."